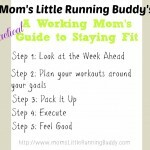 Sooo..I am still in a running rut. Well kind of. 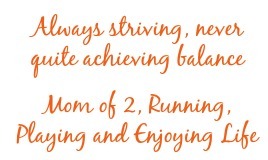 I don’t know if it’s a rut or if right now, I’m just content to let running take a backseat. Yeah, that’s it. I still run about 12 – 15 miles a week but they aren’t goal specific even though I am signed up for a half marathon in a month. I have just been running to run. 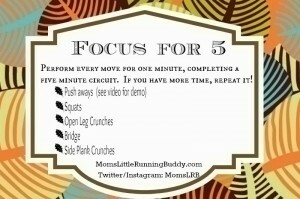 In doing that, I’ve come up with the idea of “Focus for 5”. Basically the thought is that if you have 5 minutes, you can do something that will help you get fit. Now, I won’t lead you on. 5 a day isn’t necessarily going to cut it everyday but I know, believe me when I say that there are sometimes when you only 5 minutes here and 5 minutes there. So when I have those days, I create these little workouts and I do them as often during the day as I can. One day last week, I did this particular workout 6 times. It’s not ideal but it was something. My dream is to one day do an exercise DVD but that costs money that I don’t necessarily have at the moment…SO…I’ll keep doing what I can. 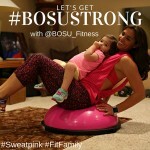 What is your fitness dream? Is there anything you would do if you could? Do you like the workout? And I was logged into the wrong account. Sorry about that Katie. What I did say in my comments was I have those days too and just do what I can when I can. 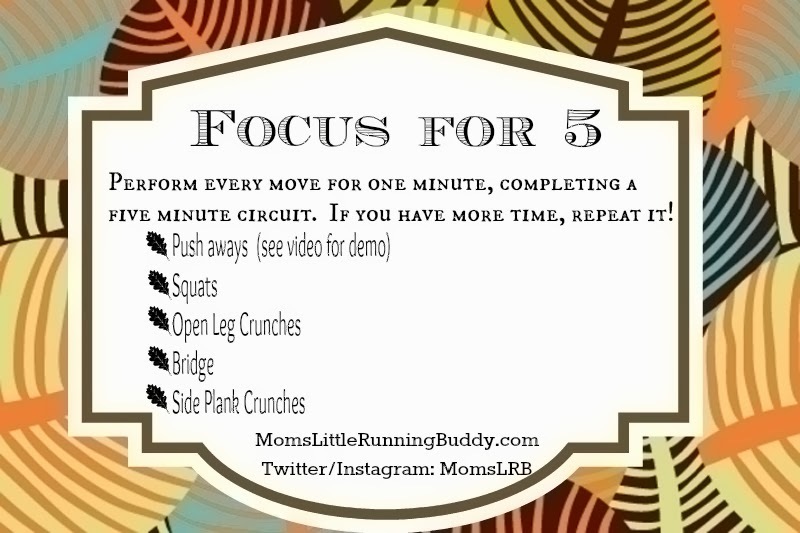 I think that something like this – focusing on 5 minutes – is totally manageable. I had a little trouble with the push-aways: when I reach down, I find I have to bend the knee of the standing leg to reach the floor, and then I can’t seem to get full range of motion on the push because of how I’m bent over. Probably just needs more work. Nice workout! I did it in the middle of my Burbathlon run.